With over thirty years experience designing, facilitating and convening events, I offer expert meeting design and facilitation services based on your needs — from an hour of remote advice to the complete design, organization, and facilitation of your meeting. Contact me for my hourly rates for work done remotely, and daily rates for work that involves travel. My service philosophy is simple: I will provide you with the truly independent high-quality consulting you need and want. I do not accept fees or commissions for facility bookings or any other contracted third-party services. Articles on my work have appeared in numerous industry publications, including Convene, Meetings and Conventions, Corporate Meetings and Incentives, Successful Meetings, MeetingsNet, and others. Here are some of my current plenaries, workshops, and presentations. I’ll customize and extend them to meet your special needs. Contact me for information on availability and fees. I frequently design and facilitate effective crowdsourced sessions at conferences. This allows conference organizers to deliver just-in-time sessions that are what their attendees want and need. Each conference is different, and I customize the process to meet client objectives. Here’s a one-minute video about same-day crowdsourcing a dozen sessions in 45 minutes for over 600 people at the 2015 PCMA Education Conference. And here’s a 3-minute video of crowdsourcing at a typical peer conference. The Solution Room is a powerful 90 – 120 minute introductory conference plenary for 20 – 600 people that engages and connects participants, and provides just-in-time peer support and answers to their most pressing professional challenges. After a short introduction, a human spectrogram is used to demonstrate the amount of experience available in the room. Participants are then given time to think of a personal challenge for which they would like to receive confidential peer advice and support. Once challenges have been determined, a second human spectrogram maps participants’ initial comfort level. Participants are next divided into small groups of 6-8 people they don’t know, each group sharing a round table covered with flip chart paper and colored markers, and people individually mindmap their challenge on the paper in front of them. After a place shift that transfers the challenge to a neighbor, each participant in turn gets an equal amount of time to receive advice and support from the others at the table. A closing public evaluation uses a final state-change human spectrogram to map the shift in comfort level of all the participants. Participants meet and build in-depth connections with 5-7 new peers through sharing their challenges, advice, and support. Each participant has the opportunity to receive advice and support from his or her peers on a personal professional challenge. Participants discover the amount of peer experience available to them at the event and learn how to tap it for their own benefit. The Solution Room can also be run for small high-level executive peer groups to provide comprehensive, confidential peer support and advice on pressing issues. This small group version uses a more structured process to explore each participant’s challenge. Solution Room Testimonials from MPI’s 2012 World Education Conference. The Personal Introspective is a facilitated closing plenary that gives each participant a carefully structured opportunity to review, consolidate, and reinforce what they have learned at the conference and develop the next steps for changes they will work on in their professional lives. A typical Personal Introspective takes 60 – 90 minutes. During the Personal Introspective attendees privately reflect on their answers to five questions that are explained at the start of the session. All attendees then have a further opportunity but not an obligation, to share their answers and obtain support in small peer groups. The personal introspective reinforces attendees’ learning while it is still fresh, and increases the likelihood of personal change and growth. In addition, the small group sharing invariably creates a heightened sense of connection and intimacy among the group members. Participants meet and build in-depth connections with 5-7 of their peers through sharing their conference learnings and advice. Participants leave with a concrete plan on what they want to change as a result of the conference and how to implement their plan. The Personal Introspective strengthens the entire conference community by providing rich opportunities for participants to discover the commonalities they share. With the rise in availability of professional content online, conference attendees are increasingly unwilling to sit and passively listen to presenters at face-to-face events. 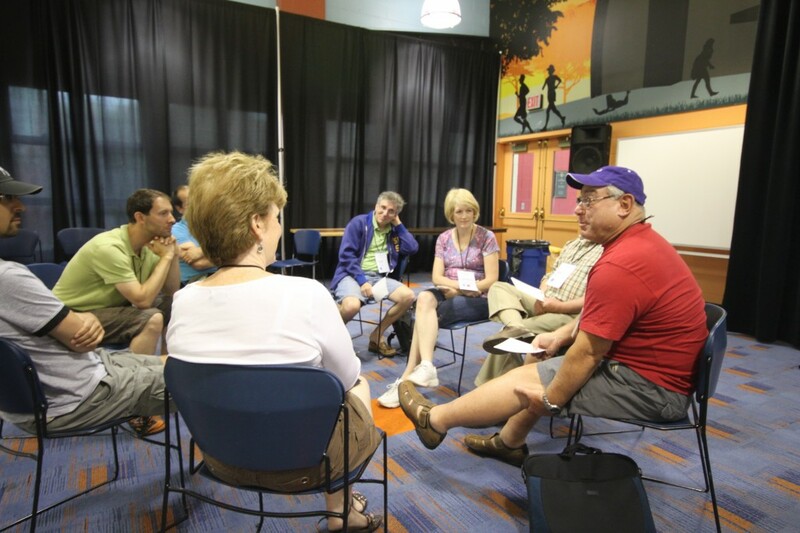 But how can we bring attendees into sessions as participatory learners? In this workshop, guided by a conference facilitator with thirty years experience, participants experience and learn how and when to use powerful participatory techniques that can improve and transform their conference sessions. Experience several powerful participative techniques that can be used at conference sessions including the Three Questions, human spectrograms, fishbowls, and affinity grouping. Understand the appropriate use of each technique. Apply these techniques to your events. After 20 minutes of introduction to the reasons for and importance of participation-rich events, participants learn about participation techniques by experiencing them in the context of their attendance at the workshop. This workshop can be shortened to 2 1/2 hours if necessary, though the full three hours is preferred. I am now offering multi-day extended versions of this workshop; learn more here. My presentations concentrate on mind-shift, from which all fundamental change occurs, not skill acquisition. In this interactive session attendees learn why participant-led and participation-rich meetings are key to maintaining interest and involvement at events, and what they need to know to consider implementing these innovative approaches. This session introduces, via participative exercises, key characteristics of these designs and techniques, popular formats, and implementation barriers and strategies. Participants will have opportunities to experience differences between traditional & experiential learning. 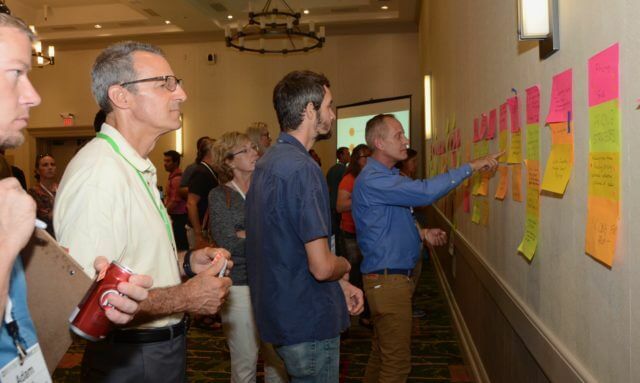 Participants will be motivated to change their events to incorporate participant-led and participation-rich design elements into their meetings. Participants will be exposed to some participant-led event designs and participation techniques that they can use for their own events. Participative event formats that facilitate greater attendee engagement are growing in popularity. With the rise of conveniently accessible online content, conference sessions that could just as well be watched on a computer are losing their appeal. In addition, research has shown that the way that adults actually learn to do their jobs has changed dramatically over the last twenty years. The majority of adult learning now takes place via our peers, not through formal training, and we need to reflect this fundamental change in learning modality in the processes we use in our meetings if they are to remain popular and relevant. In this interactive session I’ll explain why it’s vital that our future events incorporate participant-led and participation-rich designs, and introduce a variety of participative formats and techniques. Participants will have an opportunity to experience the difference between traditional & experiential learning. Participants will be exposed to participant-led event designs and participation techniques that they can use for their own events.